The point of paste tomatoes, for me, is a meatier fruit that is better for canning. But paste tomatoes are often small, making all that dipping in hot water and peeling seemingly endless. And flavor wise, they are often just so so. So, in my search for the best paste tomato, I have been looking for the following three things 1) not prone to blossom end rot 2) good sized and 3) decent flavor. After last year’s disappointments, I had pretty much just decided to can the more watery heirlooms and not worry about it anymore. But I thought I’d give a few new pastes one last shot this year. So I did some google searches and GardenWeb searches for the “best” paste tomato. This year I trialed three new varieties. 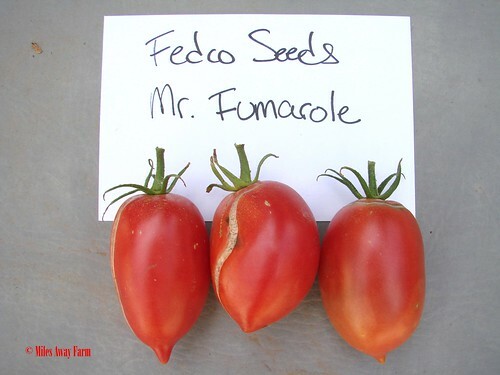 San Marzano Redorta (from Seeds of Italy – based on many recommendations), Rudgers (from Fedco Seeds in Maine) and Mr. Fumarole (also from Fedco). 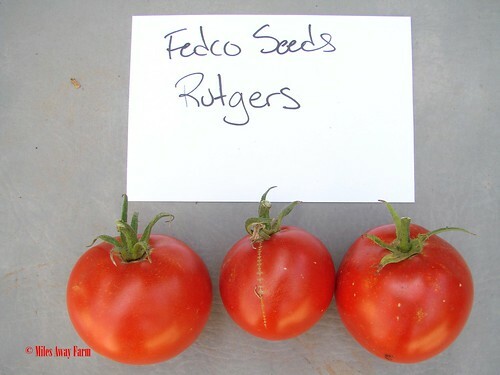 Rutgers was the tomato used by Hunts and Heinz for many years for their products (it’s a canner and a slicer). 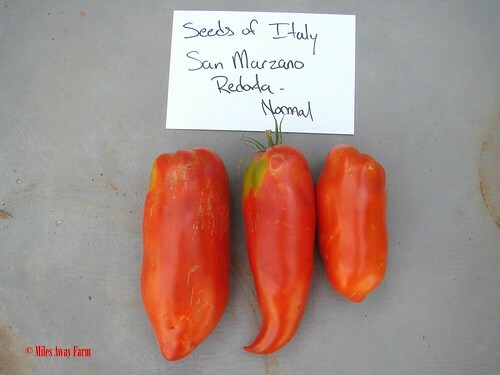 San Marzanos are the famous tomato of Italy that you can buy in cans from fancy imported food stores. The Mr. Fumarole was supposed to be resistant to blossom end rot. I started them from seed in early March and planted them out mid May. Two plants of each variety were planted. Everyone received a nice handful of organic fertilizer in their planting hole, and they were all on a drip tape system, where they received a deep watering every three days. Below are the results. These were all picked on the same day, after we’d had a rain earlier in the week. All were tasted plain. The cards with names below are 4 x 6 inches, so you can get an idea of fruit size. Mr. Fumarole. Not a huge fruit, but true to its claim, very little blossom end rot. Most fruit split from the recent rain. The plant itself was leggy and sprawling, with few leaves to cover the fruit. Flavor was fruity and complex, but just odd. Both my husband and I’s least favorite. Rutgers. Not a huge fruit, but very uniform in size, no splitting from the rain, and no blossom end rot. A nice bushy plant. Flavor was simple and bland, which, when you think about it, is just what you’d want in a fruit used in ketchup and other sauces that needed to be consistent from batch to batch. Our #3 out of 4 ranking for flavor. Surprisingly, I got two completely different types of fruit off of my two Redorta plants. One was much more round than the other. Tomatoes are generally self fertile, but sometimes a bee can force its way into a flower and change the outcome. Clearly I managed to grow an outlier that had been crossed with another variety. Size was somewhat variable and there was a little bit of green shoulders from the sun/heat. The fruit was quite large, with a little bit of lobbing at the top, but no spits. Generally a lovely meaty fruit. This was #2 in ranking for flavor. We found it to be a firm fruit but lightly sweet. True to its reputation, the correct conformation of Redorta turned out to be our favorite in flavor. The plants were bushy, the fruit somewhat variable in size, but generally much larger than the Fumarole. There were a few with blossom end rot, but nothing like the huge numbers I had last year from several varieties. Very little splitting from the rain. This won the taste test, being both meaty and sweet. 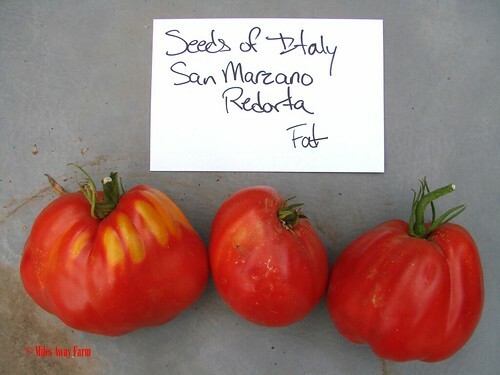 I’ve saved seed from both varieties of the Redorta. I would grow them both again. Hooray for finally finding a paste tomato worth the time and effort to peel! 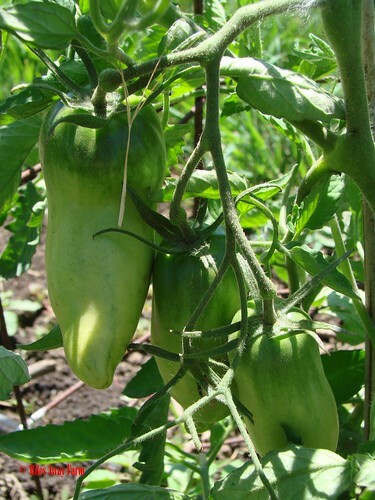 Miles Away Farm Blog © 2014, where tomato season is slowing down. Tomato pollen isn’t viable at temperatures over about 95 degrees, and our month of crazy hot weather pretty much put a stop to fruit set. We’ll see if we manage to get a few more ripe ones now that the temperatures have come down, before we get our first frost. Hooray! I have San Marzanos growing–in the weeds. If they turn, I’ll be a happy camper. Thanks for doing all of this work for us!